In Aquaponics the aim is to produce food with the minimum quantity of resources possible. The fish food is a key factor and lots of research are currently undertaken to produce the fish food locally. Insect production can also be a good solution to feed the fish. For the rest of us who don’t have the ability to produce 100% of the fish food, the fish food pellet is a resource to follow and use at its best. A system producing well is often described in terms of weight produced per volume of water. From a sustainable point of view, it is very interesting to ask the question: “What is the feed conversion ratio”? How many kilo of fish food do we need in order to produce a kilo of fish? In order to get a good understanding of the fish food conversion we need to understand a few points. The fish food pellet used in aquaculture and very often in aquaponics is “dry”. The moisture level generally vary between 8 to 12%. The fish moisture level is generally between 78 to 85% depending on the species. In this case we can easily understand that 1kg of fish food at 8% moisture is equivalent to 4.6kg of fresh fish at 80% moisture. Here we understand that when we feed our fish with 1 kg of dry fish food pellet, this is the equivalent of 4.6kg of fresh fish food. The Feed Conversion Ratio will be influenced by a number of factors. for trout a good FCR will be around 0.9 which mean that 900g of dry food will be necessary to produce 1kg of trout. 3. Body growth: Once the Metabolic and activity needs are covered, the fish can use the energy to build his body and grow. 4. Stock: If the fish food consumption is higher than the fish needs, the fish will stock the energy under the form of fat around the guts. We see that if we limit the fish food quantity, the fish may receive just enough energy to cover the needs 1 and 2 but not enough to cover their growth needs. The fish will therefore eat food but not grow. It’s therefore a limiting factor and the FCR will dramatically increase. Make sure to feed your fish properly to avoid this problem. If the food distributed to your fish is not highly digestible, the quantity necessary to fulfil the needs of your fish will increase and therefore the FCR will increase. Try to select a food adapted to the species of fish you are growing and with a high digestibility. The more often and regularly you feed and the better the fish will be able to digest and use the food eaten. By spreading the food quantity in several batches you improve (reduce) the FCR. In aquaculture the fish farmers are feeding up to 4 times a day. In aquaponics if you can feed twice a day it’s really good. As explain above, dominant fish will stress others and avoid them to grow. To avoid this problem make sure you keep fish of the same size together. In aquaculture the fish are frequently sorted, each pond contains fish of a similar size. 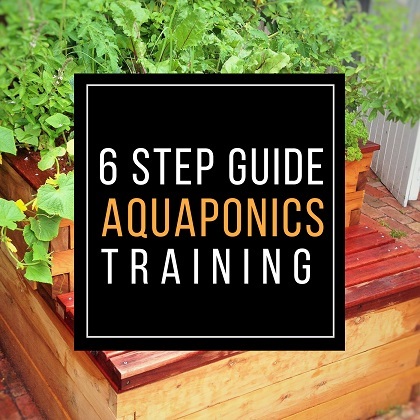 In aquaponics the number of fish tank generally limit this practice but try as much as possible to keep fish of the same size together and if you see some not growing as the others then you still have the options to sale or harvest them. Small fish can double their body weight in few weeks while large ones will take months to double their body weight. A fish kept in a temperature outside of his optimum will not perform well and will not transform the energy absorbed in growth. Make sure to keep your fish in the adapted temperature range to maintain a good food conversion. Fish breathe oxygen form the water. If the level of oxygen in the water is too low, the fish will increase the breath rate in order to increase the water flow going through the gills and maintain a correct level of oxygen in their blood. The action to increase the breath rate increase their energy consumption. When the fish digest, the oxygen consumption increase so a fish placed in an environment with low oxygen concentration will not eat correctly.